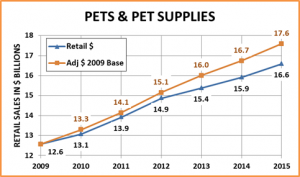 2014 brought a 4.16% increase in the total U.S. Pet Industry. This was not quite the projected 5% increase, but even factoring in “Petflation” the increase in the amount of goods and services sold was 3.46%. This means that overall an outstanding 83.1% of the growth was “real”. In this post we’ll take a closer look at the performance of the total market and its individual segments in terms of Retail Growth and Adjusted Growth, which factors in inflation (The CPI). We will cover 2014 and also put it into perspective for the period from 2009 to 2015. The Bad News is that deflation intensifies the competitive pressure on manufacturers and retailers. Long term it is not a healthy situation. 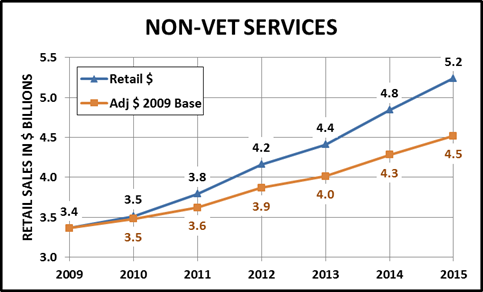 Good News – Consumer purchases in NonVet services seem to be unaffected – 68.5% of growth is real! 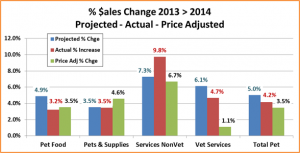 Bad News – The Vet Segment didn’t make the projected number but more importantly…76.6% of the growth was from Price Increases!! This means that total Market performance – a 4.2% increase…with 83% of this being “real” due to the second lowest inflation rate in history…was actually produced by a combination of unhealthy inflation & deflation in 3 segments. The Bar Chart below may make it easier to visualize the situation…especially in the Vet Segment. Now let’s take a look at the performance of the individual segments from 2009 to 2015 starting with Food. When you look at the cumulative, it looks pretty good. The deflation years are the most concerning. 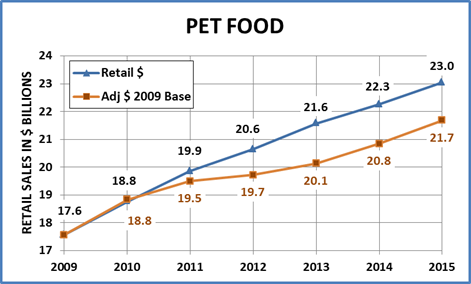 2014 was only the third year with a CPI decrease in Pet Food – 2000 and 2010 were the other two. I don’t know the situation in 2000 but the 2010 deflation came after a combined 20% Food CPI increase from 2007 to 2009 – in the heart of the recession. Real growth ceased. The decrease in 2010 brought a positive response from the consumer – adjusted growth exceeded retail sales. The years from 2011 to 2013 brought CPI increases in the 2+% range. Interestingly enough it looks like the consumer accepted the initial year of the increases but a 2.8% increase in 2012 and the cumulative effect of the increases dropped the percentage of real increase below 50%. 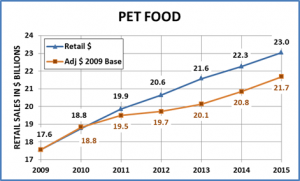 2015 Retail Food sales are projected to increase 3.5% to $23.04B. My initial “petflation” projection for 2015 is (-0.5%). No one, including me likes this. However the Pet Food CPI has only dropped in January 3 times since 1997 (including lastYear) and in both January and February only twice. It has done both in 2015 and the January drop was over 1.1% -twice as much as either of the other 2 years. Things can change but right now it looks similar or even more extreme than 2014. Like the Food Segment, the first deflationary year was 2010. However, the story is a little different. 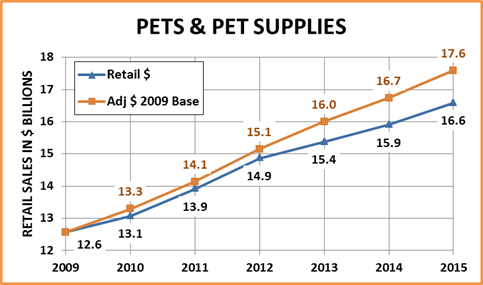 From 1997 to 2004 Pet Supplies increased in prices at an annual rate of under 0.5%. Starting in 2005 and continuing through 2009, the CPI increased an average of 2.75% per year. This doesn’t sound like much but remember it was 5 times the rate of the previous 7 years and 2 of the biggest increases (+3.0%) came in 2008 and 2009, the heart of the recession. The consumer reacted – and bought less. Prices fell almost 2% in 2010 and the consumer bought more. However, unlike Food, the prices briefly stabilized then generally began moving consistently downward. Please note that the price adjusted numbers are always above actual Retail. In terms of 2015, Pet Supplies are projected to increase 4.3% to $16.58 B. At the end of 2014 there was some indication that this segment might be pulling out of the deflationary spiral. However, 2015 has drops in both January and February CPIs. The decrease was a little less than in 2014 so I mitigated my projection to -0.8%. Now onto the Service Segments – First NonVet Services. If price increases continue or accelerate, eventually the consumer will “push back”, but it hasn’t happened yet. There are no real negatives regarding this segment. It is growing strongly and consistently, especially since 2011. However, it is a small segment, only accounting for 8.6% of the total market. 2015 sales are projected to be $5.24 B, an 8.3% increase. This seems eminently attainable. In regard to inflation rate, the average annual rate of 2.5% seems like a reasonable estimate for 2015. The final individual segment is Veterinary Services. 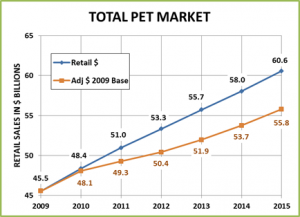 This segment accounts for over 25% of the Pet Market and has had strong retail growth but there is one overriding issue. Price increases account for 75.8% of Retail growth! 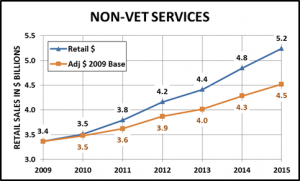 Consumers actually bought less in vet services in 2011 and 2012…they just paid more. We certainly think of regular veterinary visits as a “need” not a “want”. 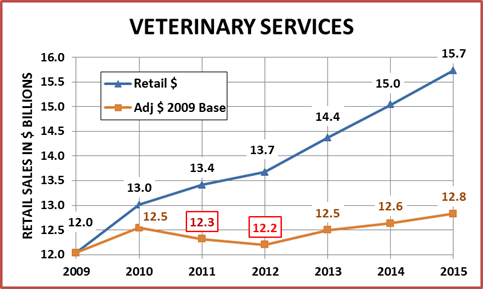 The extreme inflation over the years finally generated a consumer response in 2011…they cut back on veterinary services, turned to OTC medicines, supplements, treatments and home testing. 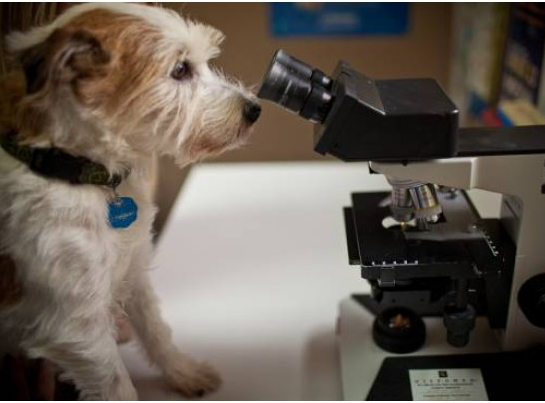 Pet Health Insurance is growing and there may be fundamental changes in Veterinary Clinics – more chains and groups. Major medical procedures and emergency care will always be needed but steps should be taken within the industry to make regular veterinary care more affordable. Veterinary Services are expected to hit $15.73 B in 2015, a 4.7% increase. Price increases should continue to be the major share of growth. I projected a CPI increase of 3.0%, slightly less than 2014. However, this may be wishful thinking, as prices in February 2015 were already up 1.2% since December 2014. Now in our final section we’ll go back to the total pet industry. Inflation: Only 8.6% since 2009; 1.38% annual increase. Deflation in the Supplies Segment continues. Commoditization, channel migration, consumer value shopping and lack of innovation have created extreme competitive pressure. Consumers are buying more; paying less. Deflation is also now a concern in the Food segment which looks to be on track to have a second consecutive year of falling prices. The Veterinary segment has the exact opposite problem. Years of inflation finally caught up as consumers actually bought less in 2011 & 2012. Overall actual sales have been essentially flat for 5 years and 75% of the increase in Full Retail Sales is due to Price Increases. In 2015 the Total Industry is expected to increase 4.2% to $60.59B. It appears that deflation may be even stronger in 2015, possibly producing the lowest CPI increase in history. We need both the deflating and inflating segments to start moving to the middle….. Finally, to me, the researching and writing of this post certainly reinforced the need for everyone to look below the surface in their business…to understand where the business is coming from and where it may be going.